Main image: A polluted waterway on Chidna Station. (Image: ABC Rural: Verdun Spreadborough). Above: UNE Masters student Georgie Spreadborough. People living near abandoned mines in remote communities have been marginalised and deserve a stronger voice in the remediation process, according to a UNE researcher. Masters student Georgie Spreadborough is seeking to highlight what she believes is an environmental injustice. She recently gave evidence to a Senate inquiry into the impact of mining pollution on her brother’s property Chidna Station, in north-western Queensland, where an abandoned copper mine (Mt Oxide) pollutes surrounding waterways during the wet season. Georgie’s grandfather Arthur Lanskey officially took up this land in the early 1900s but the family’s indigenous heritage stretches back thousands of years. “My family have a strong connection to this country and we have a responsibility to look after it,” Georgie said. 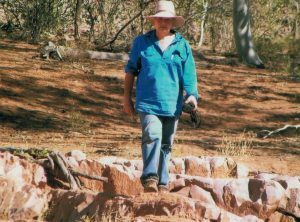 Inspired by her family’s experience, Georgie has embarked on research to explore the attachments that Aboriginal people, pastoralists and other community members have to land in the vicinity of abandoned mines. Her study will also consider what part they have been able to play in discussions about mine remediation and how that process might be improved. Mt Oxide began production in 1912 and eventually closed in 1982, when there were only simple government requirements for land rehabilitation. 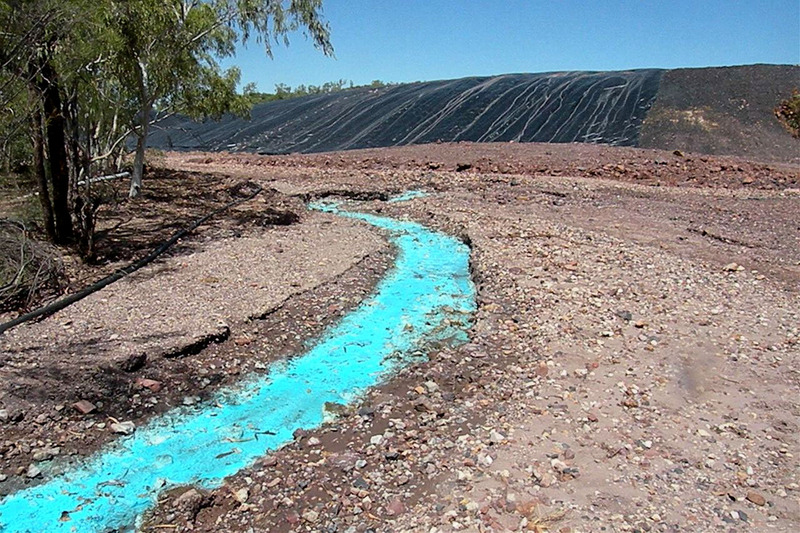 During the wet season, acids leaching from residual stockpiles and overburden dumps cause creek systems to run blue-green for several kilometres downstream of the mine. Animal deaths have been reported. “During a big rain event, the drainage from the mine becomes very acidic and everything in the nearby creeks – birds, fish, frogs – dies,” Georgie said. “This is the kind of environmental degradation that can occur when mine sites are not properly remediated. Georgie said that the Queensland Government accepted the surrender of the Mt Oxide mining lease in 1999. Substantial work has been carried out since 2008 and continues, depending on funding. In July Georgie gave evidence to the Senate Environment and Communications References Committee inquiry into the rehabilitation of mining and resources projects as part of a ‘Lock the Gate’ delegation. She said remote communities can feel marginalised in the remediation process, although the health risks posed to them and their environment may be profound. Mt Oxide is one of some 15,300 abandoned mines in Queensland. It is part of the Gulf Catchment, which contains a number of abandoned and operational mines that are possible sources of and pathways for pollution to the Gulf of Carpentaria, via the Leichhardt River. Lock the Gate has called for an independent authority to be appointed to rehabilitate abandoned mine sites.